Kul Gautaum: How A Rural Villager From Nepal Became A Top U.N. Official : Goats and Soda When Kul Gautam got a royal "no" for his passport request, he decided to do something special with his life. He tells of his journey from a tiny village to the upper ranks of the U.N. in a new memoir. At 69, Kul Gautam has written his life story and won an award from the National Peace Corps Association, made up of thousands of past volunteers. A Peace Corps volunteer was one of Gautam's early English teachers. For two years, Gautam petitioned the Nepali government for a passport so he could attend the U.S. university. But back in the 1960s, passports were given only to people of privilege — not poor villagers. His passport request went all the way up to the king, only to be denied. It was then Gautam vowed to do something special with his life. "That moment came because of the injustice of not being able to get a passport," he said on a visit to NPR headquarters last month to talk about his life and his new memoir, Global Citizen from Gulmi: My Journey from the Hills of Nepal to the Halls of United Nations. When Gautam was born, his grandfather, who had long yearned for male heirs, was elated. "He said, 'I want this boy to be someone special,' " Gautam recalls. " 'An educated pundit.' "
His grandfather and his father taught him all they knew, scratching letters of their Nepali dialect into the dirt with a stick. The boy quickly absorbed their knowledge. When he was 7 years old he moved to a village across the river to learn from a local teacher — the first in a series of moves farther and farther from home in the pursuit of education. In 1962, Gautam was a seventh-grader in a town called Tansen, one of the first outposts for volunteers with a new organization, the Peace Corps. Gautam knew only a few English words then — not enough to string together a sentence — but he excelled under the volunteers' tutelage. His education didn't stop when school did; Gautam would tag along with his teachers after class. They taught him how to play chess and Scrabble; soon enough, he began beating them. One volunteer told him if he kept up his education, he might one day study in America. There are times when the right encouragement, the right promise, echoes in your head and lodges in your heart. Even now, half a century later, Gautam's face still lights up at the promise of that dream. The idea of studying in the United States stayed with him. More specifically, Gautam decided, he wanted to attend Dartmouth — the alma mater of a volunteer who had lent him books. In the final year of high school, Gautam enlisted the help of his old Peace Corps teachers and took college entrance exams. "Apparently, surprisingly, I did very well," he says with characteristic humility. He still calls himself "a little village boy" and says that his village was, "by Nepali standards, not very remote" — a mere five-day walk to the nearest small city. At one point, he mentions in passing that he was one of the most accomplished students in all of Nepal. He was recounting his explanation to a low-level government employee why he should be granted the passport. "Obviously, he was suspicious, you know, 'How did he get this scholarship? This is abnormal.' And I explained everything, you know, I have a very good record in school, I'm at the top of the whole country in the final school-leaving exams." "But qualification is not the main criteria" for getting a passport, he says, shrugging nonchalantly. "There's one possible criteria: It is who you are related to." Yet this poor Nepali villager not only gained entrance to one of the most prestigious schools in the United States — he was offered a full scholarship. Gautam believes organizations like the Peace Corps, which was instrumental to his own education, are important for improving the lives of people like him around the world. "The Peace Corps is a unique instrument that I think is perhaps underestimated in this country and elsewhere," he says. "They are in many ways the true ambassadors of the U.S."
"He has such a great voice for his country," says Glenn Blumhorst, president and CEO of the National Peace Corps Association. This year, Gautam was honored with the organization's Harris Wofford Global Citizen Award. "He has the ability to connect with a village elder or a small child in his village, somebody who's from very humble background, to diplomats and heads of state," Blumhorst says. "That's really impressive." When he tells his story, Gautam is sure to emphasize his good luck along with his hard work and determination. But he also clearly has a faculty for winning people over. When he speaks of the government official who eventually helped him get a passport, he tugs on his ear just like the official did five decades ago — an impromptu sign for "Listen, here's the way we have to do this," a code between two villagers of how they'd work within the system to conquer it. 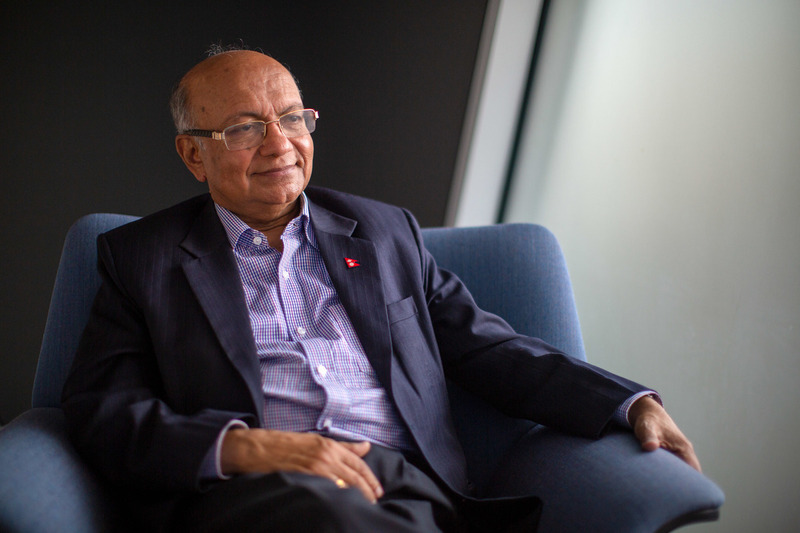 At UNICEF, where he eventually became deputy executive director, Gautam was part of the push to vaccinate 80 percent of the world's children by 1990 — an enormously ambitious and ultimately successful campaign. In addition to vaccines, UNICEF encouraged health workers to monitor children's growth and introduced oral rehydration therapy to combat diarrhea and dehydration — a major killer of children. To encourage breastfeeding in places where unclean water caused many infections, like Brazil, Gautam enlisted the mother of soccer superstar Pelé. "Of course, he is the best football player in the world," Pelé's mother said, patting the shoulder of her son in an image that was plastered on billboards around the country. "I breastfed him!" All of these improvements have had a massive impact. But to reach the remaining children in need, Gautam says, global health and development workers must take a multi-pronged approach. "You do whatever you can do. It's not one versus the other," he says. "We vaccinate people, we also work on poverty reduction, we also work on girls' education, we work on multiple fronts." That last issue — girls' education — is particularly important to Gautam. "Of the investments you can make in development," he says, "probably the most important, and the most transformative, is in girls' education." It's important not just because it changes each girl's life, Gautam explains, but also because those changes ripple throughout the whole family and into the community. Education helps halt the cycle of poverty that often traps generations of families. "Ultimately, the best vaccine is reducing poverty and providing education," he says. Gautam retired from the U.N. in 2008. He now serves as chair of the board of RESULTS, a nonprofit focused on eradicating poverty. He is optimistic about the progress the world has made battling preventable diseases and improving the well-being of millions around the globe. But, he points out, newer — and more complicated — problems arise as old ones are solved. For instance, when he was growing up, his village had no school. About 95 percent of men and 100 percent of women were illiterate. It was rare for a woman to receive any education, he says. Today, there are five primary schools in his village alone. And more girls than boys attend the public schools in his village, Gautam says. But for this longtime activist, access alone isn't enough. "You see this new form of inequality coming — a subtle discrimination," he says. More girls may attend public schools, but more boys attend higher-quality private schools, he believes. The girls have equal access to education, but not to equal quality, he says. "If the biggest challenge in development of the 20th century was access to basic services, the biggest challenge of this century is equity," he says. "How do we make sure that everybody has access, [and] that access is equitable?"